Our last night in Budapest we decided to kick up the class a notch and go to the opera. 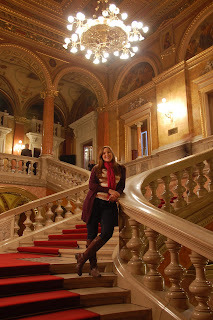 I have never been to an opera in Europe and Justin said it is something everyone should do. He went to a few on his study abroad in Germany back in college. The Budapest opera house was absolutely beautiful and just walking in put me in the mood for some high-class opera. The view from our seats...not bad huh? Now that I have raved about the opera house I wish I could say the same about the opera. We watched a Richard Wagner opera all in German with a screen translating it into Hungarian. One mistake Justin and I made was not reading the synapsis ahead of time and not having a clue what was going on. Now, Justin knows some German but even if the opera was sung in English I still think we wouldn't have understood it. We made it through the first Act or about an 1.5 hours and decided we did not want to waste 5 hours of our life sitting through this just to say we saw an opera. So I can check a European opera off the list and move on to other classy things. In the end we found an awesome restaurant and enjoyed the rest of the evening doing what a 28 and 30 year old do and not what a 70 year old does.